Chandigarh is well connected with the national capital by NH-21 which passes through the city. The four laning of the highway and the construction of a number of flyovers and bypasses has made it a fast travel corridor reducing travel time considerably. 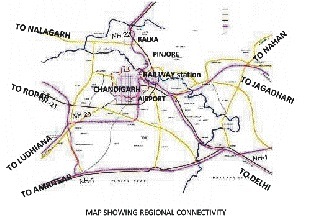 The city is also well connected to the major towns in Punjab, Haryana And Himachal Pradesh by road. The inter state bus terminal (ISBT) in sector 17 was the main ISBT for a number of decades till the recent construction of the ISBT in sector 43. The new ISBT provides interstate bus connectivity on all routes expect for few long route buses plying from ISBT sector 17. The ISBT in Sector 17 will eventually be used as a local bus terminal.